Electoral systems are one of the most influential constitutional or quasi-constitutional institutions shaping both political behaviour and political outcomes in Asia. Across Asia as whole there are today a greater diversity of electoral systems than ever before, with recent electoral reforms trends introducing various forms of majoritarian, proportional and mixed-member electoral systems. These institutional ‘rules of the game’ have very important consequences for the operation of constitutional systems, and many Asian governments have attempted to ‘engineer’ their electoral systems. 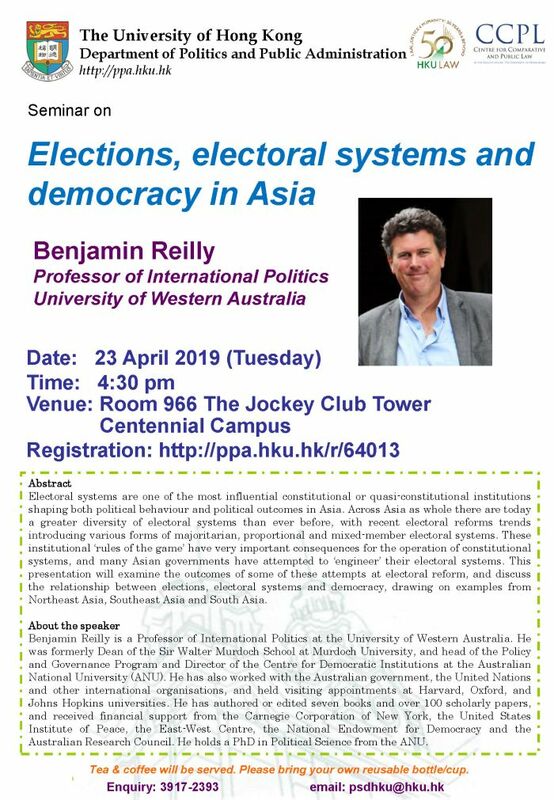 This presentation will examine the outcomes of some of these attempts at electoral reform, and discuss the relationship between elections, electoral systems and democracy, drawing on examples from Northeast Asia, Southeast Asia and South Asia. Benjamin Reilly is a Professor of International Politics at the University of Western Australia. He was formerly Dean of the Sir Walter Murdoch School at Murdoch University, and head of the Policy and Governance Program and Director of the Centre for Democratic Institutions at the Australian National University (ANU). He has also worked with the Australian government, the United Nations and other international organisations, and held visiting appointments at Harvard, Oxford, and Johns Hopkins universities. He has authored or edited seven books and over 100 scholarly papers, and received financial support from the Carnegie Corporation of New York, the United States Institute of Peace, the East-West Centre, the National Endowment for Democracy and the Australian Research Council. He holds a PhD in Political Science from the ANU.